A regular breeding resident and migrant that is restricted primarily to west-central and northwestern Minnesota; seen every winter in the southern half of the state at a few sites where there is open water. The Gadwall was an uncommon species during the Minnesota Breeding Bird Atlas (MNBBA). Broadly distributed throughout the western United States, including the northern Great Plains, and the Canadian Prairie Provinces; scattered populations can be found also in Alaska, northwestern Canada, and throughout portions of the Great Lakes region. The core of the species’ breeding population occurs in the prairie potholes of Canada and the United States (Figure 1). A game species, the Gadwall is assigned a Moderate Continental Priority by the North American Waterfowl Management Plan, and a Continental Concern Score of 8/20 by Partners in Flight. A medium-distance migrant that winters in the southern United States and Mexico. Populations in the western United States are year-round residents. A dabbling duck that feeds primarily on submerged aquatic plants. Breeding distribution and relative abundance of the Gadwall in North America based on the federal Breeding Bird Survey from 2011 to 2015 (Sauer et al. 2017). It was one of the Ducks that suffered most severely from the settling of the country, probably as much from the breaking-up of the prairie, where it commonly nested, as from the hunters. Then slowly, beginning in the 1920s, numbers began to rebound in response to the enactment of harvest regulations and passage of the Migratory Bird Treaty Act in 1918. By 1932 Roberts considered the Gadwall to be a breeding resident throughout “much of the prairie and open woodland regions of the state.” Confirmed nesting records (nests with eggs), however, were available only from Jackson and Grant Counties. Several broods of small young were also observed in Marshall County. In 1975, Green and Janssen reaffirmed the Gadwall’s breeding distribution as spanning the western and southern prairie regions, noting that it was most abundant at the Agassiz National Wildlife Refuge in Marshall County. A few years later, Janssen (1987) cited scattered breeding records farther east, specifically in Aitkin, Crow Wing, and Mille Lacs Counties (his map identifies Mille Lacs County, but his written account mentions Cass County). His map delineated a total of 11 counties where nesting had been confirmed since 1970: Aitkin, Big Stone, Crow Wing, Lac qui Parle, Le Sueur, Lyon, Marshall, Mille Lacs, Pennington, Pope, and Yellow Medicine. When Hertzel and Janssen (1998) provided an updated map of counties with confirmed nesting since 1970, they deleted the Aitkin County record and added Lake of the Woods. The Minnesota Biological Survey (MBS) reported 91 breeding season locations. All but 2 of the records were in the western and south-central regions of the state. One report was from as far east as central St. Louis County, and the second, from Carlton County (Minnesota Department of Natural Resources 2016). During the MNBBA, participants reported 280 Gadwall records in 4.2% (201/4,737) of the surveyed atlas blocks and in 3.9% (92/2,337) of the priority blocks; breeding was confirmed in 28 (0.6%) surveyed blocks (Figures 2 and 3; Table 1). The birds were reported from 41 of Minnesota’s 87 Counties and were confirmed breeding in 8 counties. Five of the counties where breeding was confirmed were new to the list published by Hertzel and Janssen (1998): Grant, Lincoln, Polk, Stearns, and Stevens. Agassiz National Wildlife Refuge continues to be a major breeding center, as well as far west-central Minnesota, including the counties of Big Stone, Lac qui Parle, Lincoln, Stevens, and Yellow Medicine. Since the MBS reported its results, there has been an increase in the number of summer records in north-central and northeastern Minnesota. The increase in the number of observations and the distribution of breeding season observations in Minnesota appears to reflect what is happening at the continental scale, where the species has gradually expanded its range through the Great Lakes and New England. Some of this expansion has been aided by small, local introductions, but the majority is attributed to the establishment of state and national wildlife refuges and the creation of impoundments that provided suitable nesting habitat (Henny and Holgerson 1974). In their comprehensive review of the species, LeSchack and his colleagues (1997) note that the species’ breeding range changed more during the 20th century than that of any other duck in North America. In addition to its expansion in the East, in the West it has expanded in Oregon, Washington, and British Columbia. Breeding distribution of the Gadwall in Minnesota based on the Breeding Bird Atlas (2009 – 2013). Summary statistics of observations by breeding status category for the Gadwall in Minnesota based on all blocks (each 5 km x 5 km) surveyed during the Breeding Bird Atlas (2009-2013). Summary statistics for the Gadwall observations by breeding status category for all blocks and priority blocks (each 5 km x 5 km) surveyed during the Minnesota Breeding Bird Atlas (2009-2013). In the Prairie Pothole Region, Gadwalls prefer semipermanent and permanent wetlands that have an abundance of submerged vegetation for feeding and emergent vegetation for cover (Figure 4). Hemi-marshes with equal cover of open water and emergents are particularly important. Both freshwater and alkaline wetlands are used. Stock ponds and dugouts may be selected when natural wetland basins are limited (LeSchack et al. 1997). In South Dakota, wetland use by Gadwalls was positively correlated with the presence of round-stem bulrushes and an irregular wetland shoreline (Sousa 1985). Suitable upland nesting habitat for this ground-nesting species may be dry or mesic prairie, restored grasslands, cultivated fields, hay meadow, or brushland. The cover is usually dense, with 25% cover or greater. Although Gadwalls nest later than other dabblers, the presence of residual vegetation from the previous growing season may influence nesting habitat selection (Sousa 1985). Typical breeding habitat of the Gadwall in Minnesota (© Lee A. Pfannmuller). Gadwall numbers are estimated by the Waterfowl Breeding and Habitat Survey, a coordinated effort of the U.S. Fish and Wildlife Service and the Canadian Wildlife Service. The survey is conducted in two very large areas: the Prairie Pothole Region of the United States and Canada (known as the Traditional Survey Area) and the eastern Canadian provinces and the state of Maine (known as the Eastern Survey Area). Although Minnesota is not included in either area, the Traditional Survey Area covers the core of the Gadwall’s breeding range and is used as the foundation for monitoring trends in population numbers. In 2015, the survey estimated a continental breeding population of 3.83 million Gadwalls (Zimpfer et al. 2015). This is 100% higher than the long-term average of 1.92 million birds (1955–2014) and 255% higher than the population goal of 1.5 million birds established by the North American Waterfowl Management Plan in 2004. 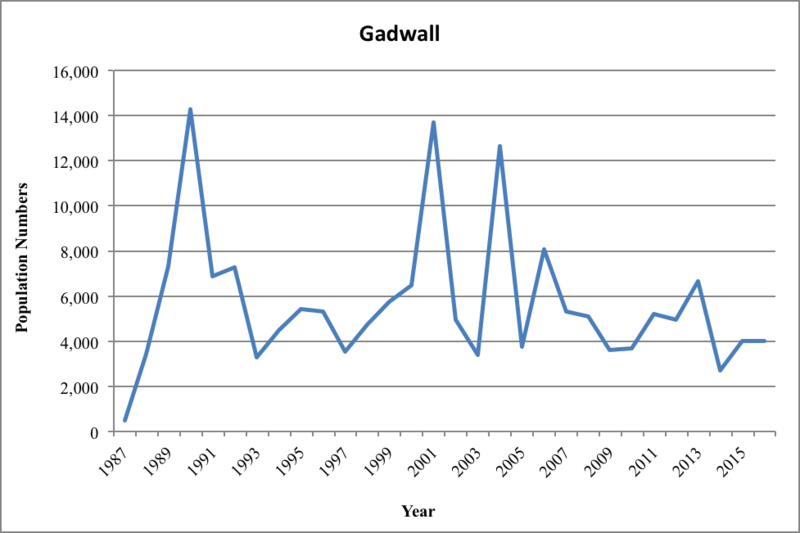 With the exception of a decline observed about 10 years ago, the Gadwall population has been steadily increasing for many years (Figure 5). 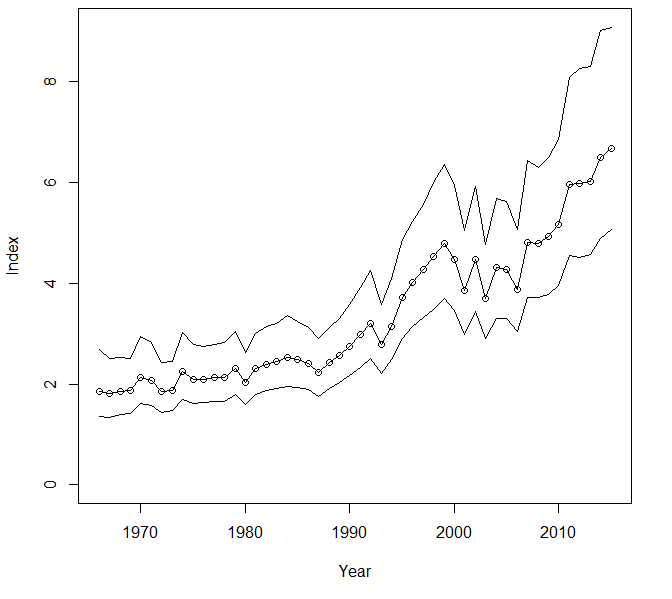 This long-term trend is corroborated by the data collected by the federal Breeding Bird Survey across North America (Figure 6). The healthy upward population trend seen nationally is not replicated in Minnesota, where Gadwalls have demonstrated wide fluctuations in numbers. Weather is always quite variable in the spring when Minnesota’s Breeding Waterfowl Survey is conducted, and the range of variability in Gadwall numbers reported during the annual survey has been quite large. Since 2000 numbers have ranged from a high of 13,670 birds in 2001 to a low of 2,703 birds in 2014 (Figure 7). Minnesota’s Waterfowl Survey is not conducted statewide; the most intensively surveyed areas do not include the species’ two core breeding areas in the southwest and northwest regions of the state. Greater variability is likely in those intensively surveyed areas where the bird is less common. Minnesota is also on the eastern periphery of the Gadwall’s core breeding range, so populations likely experience more variability at the edge of their range in western Minnesota. At the continental scale, the increase in Gadwall numbers is largely a factor of conditions in the Prairie Pothole Region. Improved precipitation patterns that began in the 1990s are considered a major factor driving higher population numbers in recent years, in concert with more focused conservation efforts. The same positive population trend is seen for two other dabbler ducks, the Northern Shoveler and Blue-winged Teal. These three species effectively reduce competition for resources with other waterfowl by nesting later in the season, which also improves overall reproductive success (Baldassarre 2014). 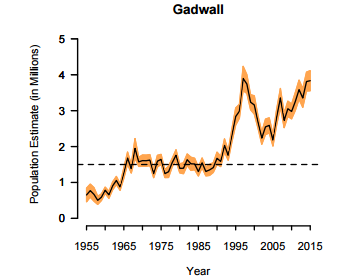 Population numbers for the Gadwall in the Traditional Survey Area, 1955–2015 (Zimpfer et al. 2015; Dashed line is NAWMP Population Goal). Breeding population trend for the Gadwall in North America for 1966–2015 based on the federal Breeding Bird Survey (Sauer et al. 2017). Gadwall numbers reported during the Breeding Population Waterfowl Survey for Minnesota, 1987–2015 (data not corrected for visibility; taken from data presented in Cordts 2015). Given the Gadwall’s expanding range and increasing population, the North American Waterfowl Management Plan (2004) assigned the species a Moderate Continental Priority. Indeed, the species is unique in having dodged the large-scale population declines that plagued many grassland-nesting waterfowl in the 1960s, 1970s, and early 1980s. Population numbers remained steady during these turbulent years, followed by a steady increase in numbers and gradual expansion of its breeding range. It has been assigned a moderately low Continental Concern Score of 8/20 by Partners in Flight (2017). A harvested species, in the fall of 2015, the Gadwall comprised 10% of the total duck harvest in the United States (1.1 million Gadwalls were harvested). Nationally it is among the most common ducks bagged during harvest, third behind the Mallard and Green-winged Teal. The 2015 harvest of Gadwalls in Minnesota, however, comprised less than 2% (17,510 birds) of the species’ entire harvest (Raftovich et al. 2016). Nearly 60% of the U.S. harvest occurs within the Mississippi flyway. As the impacts of climate change become clearer, it is critical that aggressive conservation efforts to protect and restore wetlands and grasslands throughout the Prairie Pothole Region, including in Minnesota, continue. Henny, Charles J., and Norman E. Holgerson. 1974. “Range Expansion and Population Increase of the Gadwall in Eastern North America.” Wildfowl 25: 95–101.